Watermarks are commonly used to identify a document as a draft, or to mark it as something urgent that requires immediate attention. Additionally, some organizations will use custom image watermarks that display the company logo. While these can be useful, your specific needs might dictate the removal of any existing watermark. Fortunately the menu that you use to add a watermark also includes an option to remove a watermark. 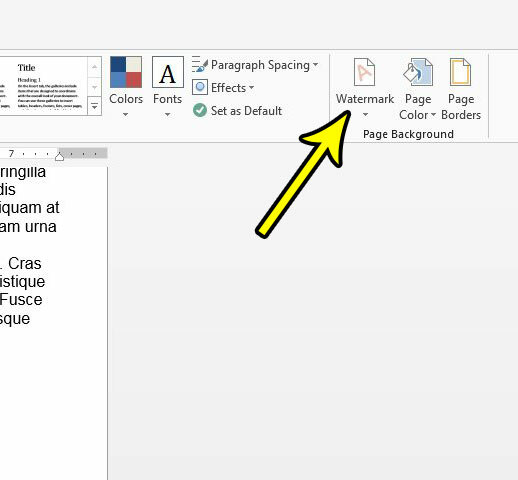 Our article below will show you where to find the watermark menu in Word 2013 and identify the button that you need to click to delete the watermark from your document. 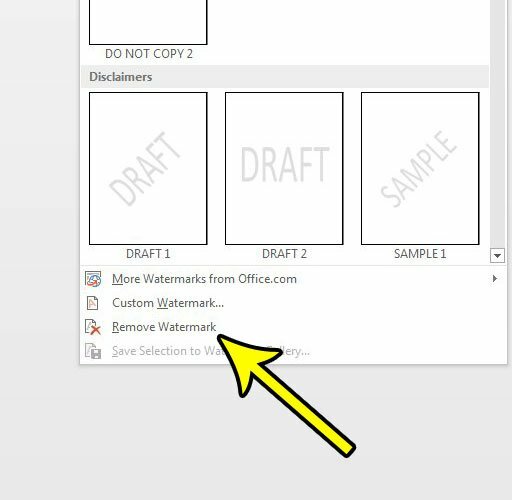 The steps in this guide are going to help you remove a watermark from a document that you have opened in Word 2013. This assumes that the document is editable, meaning that it is not locked with a password. 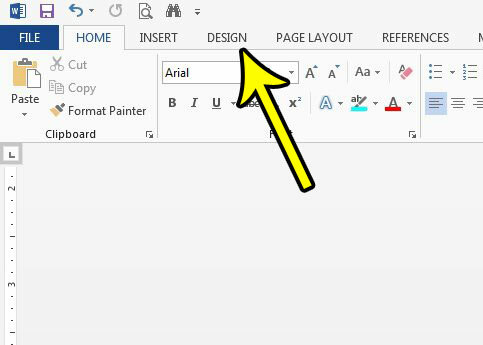 Step 2: Select the Design tab at the top of the window. Step 3: Click the Watermark button at the right side of the ribbon, in the Page Background section. Step 4: Click the Remove Watermark button at the bottom of the menu. The watermark should now be gone from every page of the document. Note that this works for both the default text watermarks, as well as any custom image watermarks that might have been used. If the watermark is still there, then it may have been added as an image rather than a watermark. You will need to manually delete that image, if that is the case. If you have a spreadsheet that is similarly afflicted with a watermark that you don’t want or need, then the method for removing that is similar. Read this article to see how you can delete an Excel watermark from your spreadsheet.